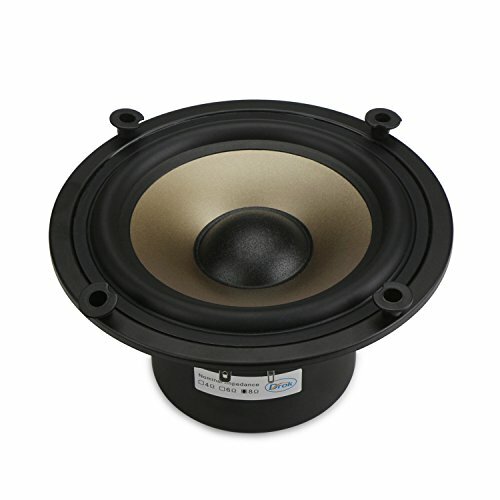 DROK woofer impedance is 8 ohms; Rated power is 50W; Unit diameter is 6.5 inches; Sensitivity is 87dB. Latest enhanced version speaker: adopt high power long-stroke design, 4 layers loundspeaker voice coils,dual magnetic to provide clear and powerful bass. The paper pulp of cone is made from a special recipe to promise the high quality low-frequency megabass, printed with luxury gold champagne color. The edge of speaker is made of the newest rubber with better elasticity, maximizing its service life. Note: package includes only a single speaker, NOT a pair, you may order 2pcs together if you need a pair of speakers.